In case you were unaware, last months zine might possibly the greatest publication ever made. I can’t say that with any facts to back it up but I hope it is enjoyable. Again this is the last zine for sometime before it starts up again later this summer. If interested in the entire collection to this point just contact me directly and I can send them along your way. Salvador Dali would be proud of me for this one. Just in time for the end of February, I present the next portrait with Waffles. 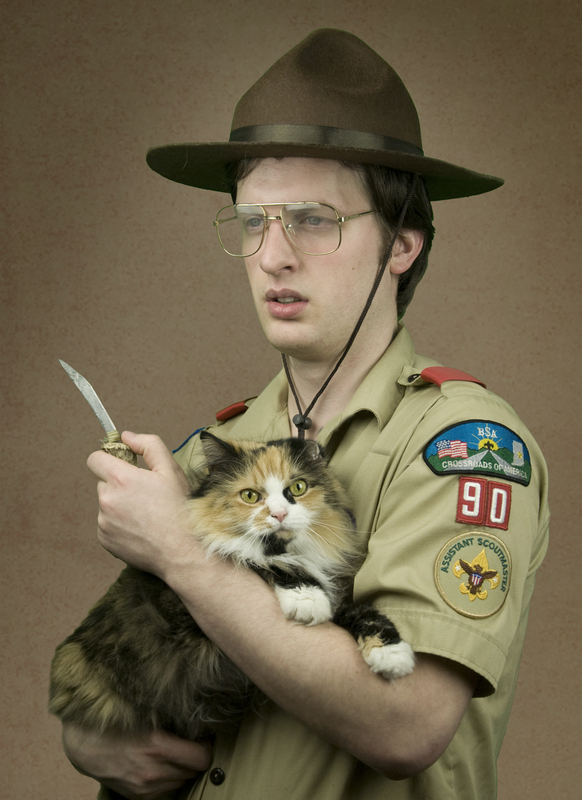 I chose this image mostly because I am an Eagle Scout and a former assistant scoutmaster. The uniform in this image is mine and I really wanted to pull this out for something in this work. Coming in a few days you can find the next edition of Everything Waffles Monthly. This publication is still free at the moment and I encourage you to send me information to get a copy sent to you. Doing our good turn daily. The Everything Waffles Monthly has also become an official publication being held in a library’s collection in Portland. The Kickstarter project is still alive and I encourage you to continue supporting it. More images to come with other work happening behind the scenes, scout’s honor. We are still pushing the Kickstarter project funding for another 28 days. To keep up the series of promo videos, here is the third installment in this series. I believe there are 16 costume changes during this filming, all in which Waffles becomes more anxiety throughout the shots. We are still looking for funding for our project and there are update rewards for those are interested in helping. Get over to our Kickstarter page if you want to see Everything Waffles to entertain you every week. And in case you missed it, there will be an Everything Waffles monthly publication coming out soon.